Younger people in Western Europe differ in a variety of ways from older adults: They tend to be more left-leaning, more progressive in their social and political views, more receptive to immigrants and more favorable toward the European Union. They are also more mixed in their views of traditional center-left parties than older Western Europeans. Here are five facts about how 18- to 29-year-olds in Western Europe differ from older age groups, based on a Pew Research Center survey conducted in late 2017 across eight countries. 1 Younger Europeans are more left-leaning, though no more likely to hold populist views. 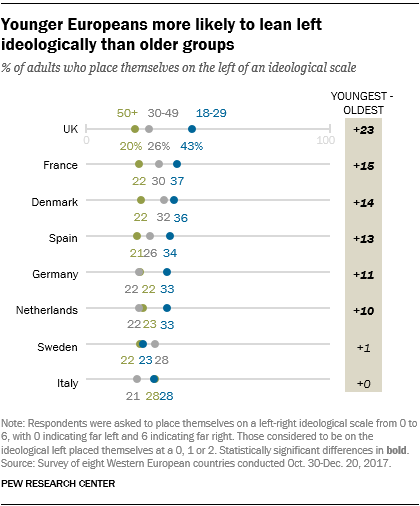 Around a third or more of those younger than 30 placed themselves on the ideological left in six of the eight countries surveyed. In most countries, this made younger people significantly more likely to be left-leaning than those ages 50 and older. In the United Kingdom, for example, 43% of those under 30 placed themselves on the ideological left, compared with only 20% of those 50 and older. 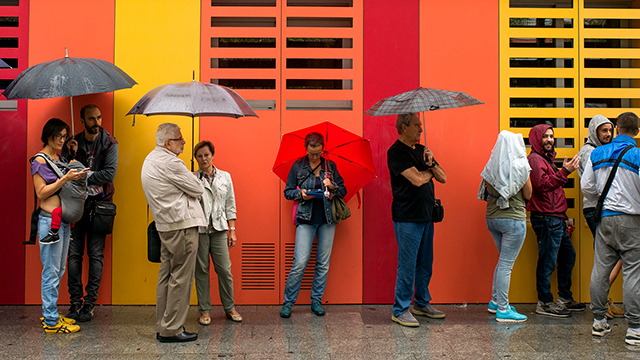 2Younger Europeans have mixed evaluations of traditional, center-left parties. Although younger Europeans were much more likely to fall on the ideological left, this did not translate into more positive views of the traditional center-left party in many countries. In most countries, younger Europeans were no more likely than older adults to identify as partisans of these center-left parties. And in Denmark and Spain, those under 30 had less favorable opinions of the center-left parties than older age groups. In many of the countries surveyed, adults ages 50 and older were the most likely to identify with traditional parties on the center-left or center-right. Those under 30, by contrast, were more likely to align with – and have more favorable views of – left-leaning, green and progressive parties like Podemos in Spain, France Insoumise in France and Democrats 66 in the Netherlands. 3 Younger Europeans are more socially progressive when it comes to gay rights and women in the workplace. 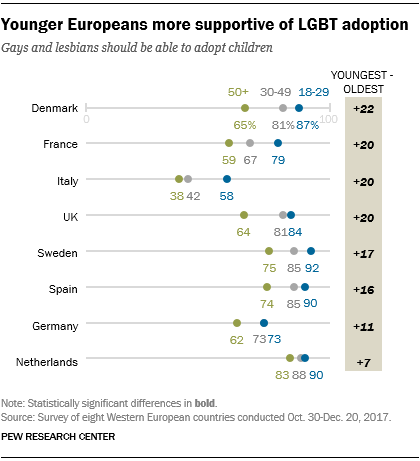 In all eight countries surveyed, younger people were more likely to say that gays and lesbians should be able to adopt children. Even in Italy – where fewer than half of Italians support LGBT adoption – a majority of those under age 30 (58%) said gays and lesbians should have this right. In all but Germany, those ages 18 to 29 were also much more likely to say that it’s better for family life when women have full-time jobs. In the UK, for example, nearly three-quarters (73%) of those under 30 said it’s better for family life to have women working, while only 46% of those 50 and older said the same. 4 Younger Europeans are more positive about immigration’s impact on their countries. In most Western European countries surveyed, people under age 30 were more likely than those 50 and older to say immigrants make their national economy stronger with their work and talents. In France, for instance, a sizable majority of 18- to 29-year-olds (71%) said immigrants help the economy, compared with just 42% of those 50 and older. These age differences were significant everywhere but in Sweden, where majorities of all ages said immigrants contribute positively to the economy, and Italy, where all age groups were split on whether immigrants are helpful or burdensome to the economy. Younger people also differed in their views about immigration’s impact on their national culture and security. In every country surveyed, younger groups were far less likely to say immigrants should adopt the customs and traditions of their new country. Just 39% of Swedish 18- to 29-year-olds said immigrants should assimilate, compared with 71% of Swedes 50 and older. Those under 30 also were consistently less likely than older people to feel that immigrants increase the risk of terrorist attacks in their country. In Denmark, a majority of people ages 50 and older (55%) said immigrants increase the risk of terror attacks; just 30% of Danes under 30 said the same. This pattern appears in every country except Germany, where younger and older age groups were similarly split on whether immigration affects the incidence of terrorism. 5 Younger Europeans are somewhat more supportive of the EU. 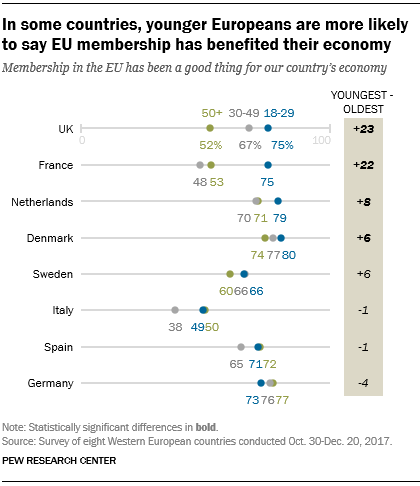 In half of the European countries surveyed, people ages 18 to 29 were more likely than those 50 and older to say EU membership has been good for their country’s economy. In the UK, where leaders are currently negotiating the country’s exit from the EU, a strong majority of those under 30 (75%) said the institution has benefited the British economy. In comparison, only around half (53%) of Britons 50 and older said the same. The gap between the youngest and oldest groups was about as large in France. Younger Europeans in most countries were more supportive of their national governments transferring more powers to the EU – although still only about one-third of those under 30 approved of such a measure. In Denmark, for example, 34% of those under 30 supported transferring more national powers to Brussels, compared with 27% of those 30 to 49 and only 16% of those 50 and older.